Before Leaving the United States for his week long Visit to Africa President Bush Stated that he "Had a Firm Heartfelt Commitment to Africa." One of the things that he will witness is the Presidential Emergency Fund for HIV/AIDS. In His last Budget to be Presented to Congress He has asked for an Additional $ 30 Billion. The Main Goal of this trip is on Economic Development of Africa. But Military Relations, Trade Policy and China are expected to be discussed as well. Although He has stated that He has a Heartfelt Commitment to Africa there have been several Instances When He has not take n a Stand in a Crisis. DARFUR is one Crisis where the United States has not taken a strong stand. Officially the Position of the US is that there are enough American Soldiers in Muslim Countries. Sadly the Fighting has Spread into neighboring T'Chad and the Central African Republic. Hopefully the US will assist the Peacekeeping Mission when its Needed. The Situation in Ethiopia is another trouble spot. There is a threat of renewed Hostilities with Eritrea that could occur at any given Moment. Also the Country has intervened in Neighboring Somalia but there are two reasons why the US should scrutinize its ally. 1. )Human Rights: The Internal Security in the Country is Tenuous at best. There has been a history or crackdowns against the Independent Media and the Political Opposition. There is Pending Legislation currently in the Congress called HR 2003 which will call for a Respect for Human Rights and other criteria. 2.) Somalia: This is the cause of most of the scrutiny against the Zenawi Government. Plus add in the Drought in the Oromo Region and it adds up to an Ally that needs some Positive Influence from Washington. President Bush is on his Second and Final trip to Africa as the Leader of the Free World!!! On a Positive Note Secretary of State Rice is being Dispatched to Kenya early Next Week to Support the Talks aimed at Restoring what was considered to be Africa's Role Model for Democracy. There is Legislation in Congress that will curtail US Aid to the Basic Necessities unless Peace is restored. Before He left President Bush Criticized President Mugabe of Zimbabwe. Relations between Zimbabwe and the US have been Frigid. 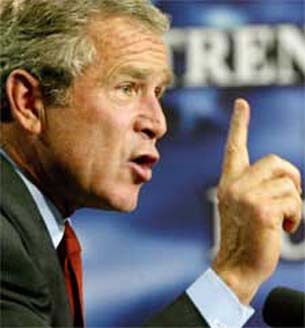 The US considers the elections of 2002 and 2005 not to be Free and Fair. Presidential Elections are scheduled for March 29th. How will the Administration react when what has been the Norm occurs again? Will there be more Sanctions against Mugabe and His Cronies in ZANU-PF? Uganda has had an Agressive Foreign Policy during the Second Term of the Incumbent. Assisting Ethiopia in Somalia and according to some report deploying troops to the Kenyan Border. Also President Museveni has threatened the DRC when it has suited his needs with the backing of the White House. Will this pattern continue? There is still some considerable Unease about the status of the Forward Deployment Base for AFRICOM (African Command). Although there are 1,700 Troops currently in Djibouti, Liberia wishes to be the host of the Forward Base. Well Mr. President maybe it has been a priority for you but maybe for the wrong reasons.